It is the time of year for fresh fruit! We had card class last Thursday and I served my favorite summer dessert - Angel Food Cake, strawberries and Cool Whip. So yummy! I thought I would share some fruity cards I made. These all use the new Fresh Fruit set and the Fruit Stand Designer Series Paper. This was super easy. Stamp some pears on some Whisper White, use the Polka Dot embossing folder for a little extra texture. Mat some DSP and add a sentiment. Quick & easy card! I used the Shimmery White cardstock for the background on this one. Some quick stamping and then a little spritz of water gives it a watercolor look. Finish it off with a sentiment & some bakers twine. Another quick and easy one. I took a strip of scratch paper and laid it across the cardstock. Stamp all around and onto the scratch paper. When you remove it, you have a perfect spot to add a sentiment! This is my favorite. I saw this technique at On Stage in Salt Lake City and wanted to try it. The circle is Watercolor paper. I stamped the peach and then spritzed it with water. It's hard to see in the picture but I embossed it with clear embossing powder. I need to practice some more on this technique - the embossing powder didn't stick to the wet paper as well as I would have liked. Did you see the latest deal from Stampin' Up? It's bonus time! 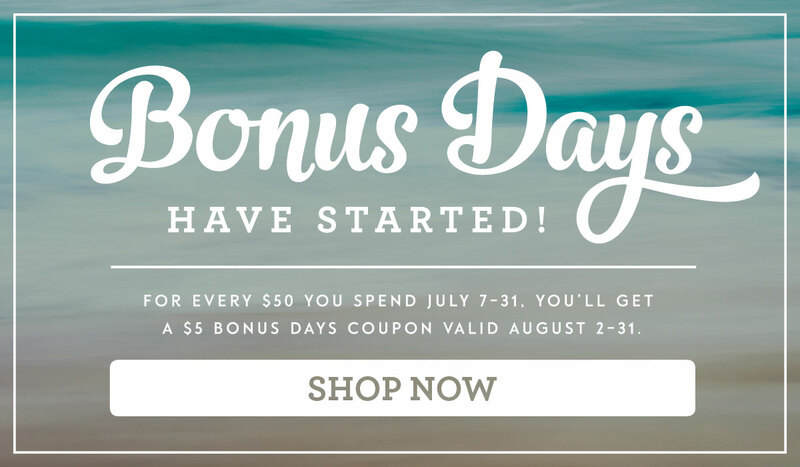 For every $50 you spend (at 1 time) in July you get a $5 bonus coupon that can be used in August. Start making your lists now!